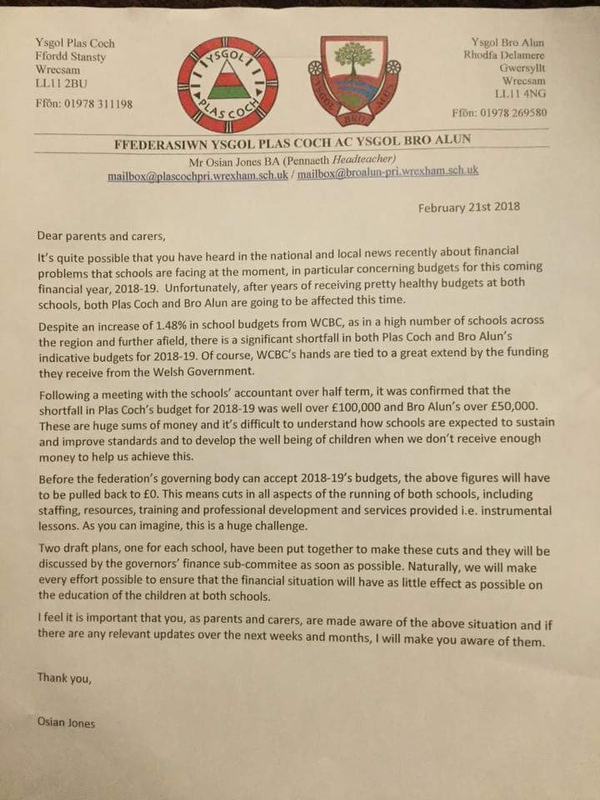 A very concerning letter has been circulated on Facebook this evening by concerned parents from Plas Coch & Bro Alun schools. A direct effect of the council budget passed yesterday. It also leaves the rest of us with children very concerned about what is going to happen to the schools that our children are going to if they have no money to even pay for basic teaching equipment or for staffing costs. I am aware you’re a staunch labour supporter (and I like to try and see things from both points of view)… however looking at the proposals put forward in the ‘alternative’ budget, that would go a whole distance in order to plug this gap? Yes, the music service would have an impact – but that’s a £250,000 between approximately 50 schools (ish?) and that’s just under the presumption that Wrexham music service is wholly geared towards schools. I’d have to check the webcast again and scrutinise the proposal more carefully… but I genuinely don’t recall anything in the alternative budget that’d support your argument – there was the argument of adding £500,000 in to SECONDARY schools (of which neither of these are)? Surely… if the alternative budget was passed, then the opposition parties would have been voting in favour of the budget as amended by their amendment? Which would have seen exactly the same set of finances put forward. If they weren’t going to vote in favour of the amended budget, then why was the amendment put forward in the first place other than for a bit of media attention? However, if I’ve overlooked some critical elements of the alternative budget that would satisfy the budget deficit – please let me know. I don’t think it’s a particularly ‘nice’ budget – and there are certainly bits that people can take a slight to in my opinion. However, I find it rather naughty to try and make a party political point out of the budget when amended would have had the support of Labour, Plaid et al. Well first off this has nothing to do with scoring party political points. If you read all my views on the Bryn Alyn school thread, I hold equal levels of concerns with the way funding has been handled at the Welsh Government level which is obviously Labour ran, as I am with the council, which is not. I think you are fully aware that if Labour or any of the other anti-austerity parties were actually in charge of the council at the moment there would have been a greater opportunity for them to actually explore a more full budget offering that addressed the potential shortfall in individual school budgets. It’s a cynical & cheap move by the Tories to suggest opposition councillors should spend all their time & resources hammering out a blow-by-blow counterpoint budget when they are far better off spending their time and resources serving their ward constituents and the town in general. It is entirely acceptable in my book for the opposition parties to put the original budget through scrutiny and raise red flags over areas they have major concerns with. It was plainly obvious and played through on budget day that the 2 Indy groups and the Tories were all going to vote the same way anyway – there were hardly any genuinely true independently minded councillors who could have had their opinions swayed. There is definitely some kind of whipping system within the 2 Indy groups, which is ridiculous as that excludes them from the very notion of being independent. So you pretty much know the original budget is going to be passed otherwise the ruling Executive has effectively lost power. Anyway, perhaps if Wrexham council was ran on some kind of purely technocratic basis then I’d expect every single group within the full council to produce rival budgets of a high specification and then everyone would vote on the best option, but that’s just not how it works. The exec board had paid help from external consultants to put together the Difficult Decisions consultation that formed the basis of the budget. Then even then there were errors in it and things that were completely unclear, so I don’t think there’s any top class budget-making ability going on in the town. All matters of the budget-process aside – many of us responded in the strongest way possible to the consultation that schools were at risk of being dangerously underfunded under the proposals. Only a serious intervention from headteachers and managers/governors etc… where they stated a budget freeze would provide an untenable situation meant that they even improved the funding allocation to schools slightly & that was still found to be inadequate. Now this is where I come from, I’m expressing my concern as a very worried parent of a school age child and this letter that has come into circulation from other local schools is signalling alarm bells about what the current situation might be in my child’s school. I am desperate to know if they are also on the brink of running out of money to buy books and pay for teaching staff. I’m sure a lot of other anxious parents are currently feeling the same way as I do. If it was a Labour Council in Wrexham giving our kids the short shrift, I’d also give them absolute hell. I was extremely critical of the now defected Labour members who threatened to close down Plas Madoc who of course I had no foresight that they were in fact going to do so at the time. Not everything in life is cheap political point-scoring. The fact of the matter is there are a number of us in Wrexham desperate to ensure that the social welfare of the town doesn’t go downhill any further. We need to fight tooth and nail for the lifeblood of this town. That includes finding a way to get someone to actually listen and do something about the schools before we end up with yet another generation of poverty and social inequality, with too many young people ill equipped with the basic skills to get on into the world of work and make a reasonable living and not have to rely on handouts. For them not to have to look over the border into the pretty well to do counties of Cheshire & Shropshire & see that kids there are getting given a much better standard of education, essentially in the same country of the UK, but really a world apart. You do have to wonder what public reaction there is going to be within wards for any councillors who currently sit on the board of governors for their local schools, if they voted for such an austere budget for education and it ultimately leads to a critical budget shortfall within their school. What happens if the school has to cut staff members? What if it leads to a failed inspection and ending up being put into special measures? Surely that is a direct conflict of interest with protecting the best interests of the school and its pupils and teachers. If any major shortfalls and failures do occur then I would expect these councillors to be held directly responsible and resign from their governor position OR force through emergency provisions at councillor level to ensure all schools are met with adequate funding for the forseeable future. There is a list of interests for each councillor on the Wrexham council website to see which are school governors and the voting record on the budget vote is also publicly available. No doubt we are going to be finding out very soon which schools are going to see budget shortfalls within the next few years. Then inspections they just keep coming. Tick tock, tick tock. It should not be forgotten that many of the Councillors who voted the budget through that will impact on schools are themselves a Local Authority appointed person to the Governing Body of Schools in Wrexham. As all people on Governing Body are supposed to act in the interest of the school in what they do (this is stated when a Governor goes on Governor Training) then it would be a fair proposition that each school that has a Council Member that effectively voted for the cuts should ask them to step down and get the LA to appoint someone different. The position of a school Governor (or anyone else) who has acted against the schools best interest should go NOW! Let’s see how many of the independents are prepared to step down from their Governor role. This is not about Party Politics but people understanding when they are in a Public Office position they should uphold the standards of that office and not then be dragged along with the flow. If you look on the Council site under Declarations of Interest for the last 12 months and select Personal and Prejudicial and then Ctrl+F search school you will see entries relating to several councillors with a conflict of interest relating to an education discussion taken place at council meetings. This means that several of them are able to bypass their conflict of interests and effectively vote against the best interests of their own schools with this GET OUT OF JAIL CARD listed in the code of conduct. As long as they are punishing all schools in the area and not just their own then it seems to be permitted. Still completely baffling, like a doctor voting to withhold vital medical treatment to everyone in a hospital even if it means several of his/her patients will end up suffering as a direct result. Every school is supposed to have at least one LA nominated person on a Governing Body – they do not have to be a Council Member but in most instances they are.